youngterrier wrote: I also think this game says more about how good NDSU is than how not-good we are. How many years in a row does NDSU have to finish top 4 until they jump to G5? I agree that this was a display of the strength of the Bison program. Sure, they have the home field advantage, but they have a lot of talent and coaches that know how to coach. As for NDSU jumping to FBS, I'm not sure they want to. The announcers mentioned their recruiting pitch about playing for championships instead of lower tier bowls (how do you feel about that statement ASU and GSU?). The money would be better, but it doesn't appear that they are wanting for financial resources. There's something to be said for being comfortable with your situation and maximizing your advantage. They've already sustained this through one coaching change and I doubt they are far from having to do that again. The only way I see this dominance waning is if they botch a coaching hire. My hats off to them for what they have accomplish. They are the class of FCS all the way around. I read a story about the money aspect to NDSU and it was fascinating. They can schedule at least 6 games each year at home in the regular season. Then, if they get the max, they get three more home games in the playoffs, and that gate doesn't have to be split with the conference. Compare that with an App St that plays in that screwy league and they have to split all revenues post season and TV. In a 12 team league you get expenses and then split all revenues, hoping to get several teams into bowls. Evidently, for NDSU it is much more lucrative to stay FCS. You have 9 home games with 20,000 at each, and many folks paying a premium in the form of contributions to get those seats. Pretty impressive. All that is just fine if you like and are comfortable being the biggest dog in the yard and never wanting to play in a league (FBS) with equally situated (and talented) programs to see just how good you can really get. 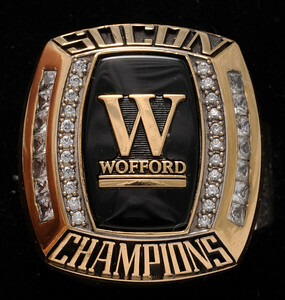 Glad Clemson and USC didn’t share their view when the old SoCon fell apart. Otherwise we’d be playing them as conference foes. NDSU absolutely should be FBS..
need a conference invite 1st. (only 2 near are Mountain West & MAC... and NDSU would be #1-2 day 1 and they don't want that.. nor do they like the travel & 118th tv market. secondly, too many small town yokels that don't think big enough (some in the NDSU admin) they are dang happy to be the big dog that they won't leave the kennel! Lakesbison wrote: need a conference invite 1st. (only 2 near are Mountain West & MAC... and NDSU would be #1-2 day 1 and they don't want that.. nor do they like the travel & 118th tv market. I could see that with the MAC, those schools rise and fall almost annually based off coaching changes, etc. No doubt NDSU could win big quickly in the MAC. I don't think the Mountain West would be as easy a nut to crack, but NDSU would be at least middle of the road. It would be interesting to see if it happened. NDSU is stuck with the FCS and the FCS is stuck with NDSU until they get a bigger stadium/dome (for instance, Georgia Southern and App state both seat 25-30k, even Montana sits 28k) , glancing at message board hearsay it doesn't look like that will happen. Just watched the replay. NDSU was playing chess while we were playing checkers. Thank Furman and Samford film study for helping NDSU disect us. Yeas the turnovers hurt us, but from the looks of it NDSU could have 99 yard drives with ease and had the same outcome. NDSU used the flooding zones concept. Run off the CB'S and run a TE/RB up the rail and another on the hash and read the safety (Furman game with #3 up the side line first time we played). Same concept with double verticals on the hash and underneath crossing routes (Samford 2.0). Thought we matched up personel wise. It just came down to a offensive staff with years of NFL, Big Ten, and Big 12 experience. 10-14 after the last drive was successful was not the time to bring him in. Now on this side there was a talent gap. NDSU's front seven were just that talented. With other teams the line of scrimmage was always to our advantage. NDSU fit gaps and minimize any play action passes we drew up. Thought we could have involved the TE a little more in the passing game to help with clearing out passing lanes or giving the QB hot reads. All in all a great season and proud of the way the young men played this season. Looking forward to next season and hopefully we will take the necessary steps to get to that Elite level of FCS football. No excuses. The bottom line is they were well prepared, deeper and better than we were. If we want to compete at that level, we cannot get away with being one dimensional on either O or D. On O if we are ever going to impose our will running the ball, we have to have an incredibly dominant O line and/or open the field up with some passing On D, we have to be able to put pressure on the QB and defend against the dink & dumps. The other thing we have to be is rock solid (i.e.. at least 2 deep) in about every position which I think is an area where we have improved significantly in with good recruiting over the last few years and need to continue to focus on going forward. As a famous philosopher/wrestler once said: "If you want to be the man, you gotta beat the man." They did not dink and dump us; exact opposite in fact. They flooded zones vertically and took advantage of mismatches with our OLBS. We took away away their run (for the most part) so their feasted on our run first scheme. If we had gone to nickel, they would have run it up our butts. Great team and great game plan v us. Big time program playing at our level. Hats off to them. But takes nothing away from our team or program or schemes. Ruckus wrote: They did not dink and dump us; exact opposite in fact. They flooded zones vertically and took advantage of mismatches with our OLBS. We took away away their run (for the most part) so their feasted on our run first scheme. If we had gone to nickel, they would have run it up our butts. Great team and great game plan v us. Big time program playing at our level. Hats off to them. But takes nothing away from our team or program or schemes. Understood, but regardless of whether it's dink & dump or flooding the zone, NDSU was able to adapt and to exploit whatever we were giving them. We weren't able to do that. I am all for giving credit where it is due and NDSU certainly showed us who the better team was. However, I don't think any program worth its salt just accepts that result. So, the $100,000 question is what do we have to improve in order to compete against the likes of them and JMU? It's my understanding (and any former player or more knowledgeable poster can correct me if I'm wrong) that our defensive strategy is to not get beaten deep and stop the run. We're vulnerable to the dink and dunk and the flooding of the zone (it's just that most teams don't really try the latter, because to do so they need to have good enough OL to block our always good pass rush, NDSU had those kind of players). In that regard, our defense is systemically vulnerable to those kind of pass plays (just as teams that run more man coverage are more systemically vulnerable to getting beat deep), but 90% of our opponents can't exploit that weakness. There's no such thing as a defense that can stop everything. Every defensive scheme has strengths and weaknesses, it's up to the coaches to choose the ones that are optimal to win. It's subjective. The grass is always greener on the other side of the fence. We can complain about the current scheme, but if we switched things up, we'd have something else to complain about (for instance, Western Carolina has one of the best pass defenses in the country, but it's run defense is terrible). So, I'm not inclined to say that it's the coaches fault. For the Southern Conference, this is a great strategy, especially since we have better athletes (or at the very least, a deeper bench of athletes) than we did 10-15 years ago. We run a scheme that's designed to compensate for inferior athleticism, and in my opinion we've closed the gap on athleticism, so we do some things really well/better than we used to (for example, stopping the run, pursuit on screens are like a heat seeking missile more than ever before) but we don't seem to have improved much on these systemic weaknesses. I'm not of the "fire coach x" mentality. That's a dumb mentality. But I do question the offensive/defensive philosophy, because I think there's valid evidence that we've not been out-recruited by conference foes or many FCS foes, yet we still can't break through the quarterfinals anymore. We're 1-5 in the quarterfinals. I think the scheme works to win the socon, but the socon isn't what it was 10 or even 5 years ago, if we want to take the next step as a program, I feel like we need to rethink our approach. The only option team to win a national title was Georgia Southern. I'm inclined to think that's because they were Georgia Southern and had some great athletes, not because of the option itself. Even though I think academic standards are a little overblown by us private school types in terms of limiting recruiting, we're still not going to out-recruit the top 5 programs in FCS. Still, three private schools have won the FCS title (Furman, Villanova, and Richmond). None of them ran the option. It's not impossible for us to take the next step, I'm just really skeptical that we can do with an option offense, or any offense that could be classified as a gimmick (like the air raid). The defensive philosophy compliments the offensive philosophy, more so than in other schemes (I'm pretty sure GSU didn't run our defense and was just fine, for instance). Namely, we try as much as we can to slow down the game and minimize possessions. The multiple 50 defense is just as much a "gimmick" defense as the TO is a gimmick offense. Basically, my point in all of this is that we're not here without the contribution of Coach Ayers and his staff, but I do feel like our offensive philosophy has a ceiling in terms of how far it can take us. I'm sure if they wanted to change things up, they could do it, and I'm not trying to imply anything negative or malevolent. I just want to see us win and I think we're capable. But on the bright side, we're still a top 5 private school power, I'd say fourth, with a huge break between us and number five. I just wish we could do more. For some continued perspective on this topic, here is a timely missive from Shanesy with which I must agree. I think the way we lost says just as much about our scheme as it does how great NDSU is. Maybe without a juggernaut such as NDSU we're a perennial semifinalist team with margin of error (sometimes going to the championship, sometimes losing early, etc). I just look at how our offense performs in the playoffs, and it's not impressive. NDSU is a program onto itself. They are quite literally in a league of their own, regardless of what their conference mates say.